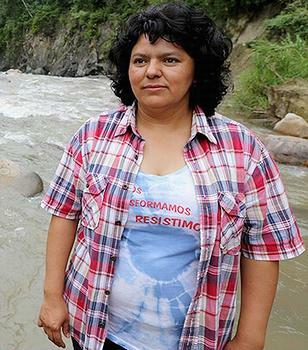 MIRI, Sarawak, Malaysia, March 8, 2016 (ENS) – Indigenous leaders fighting against dams worldwide have issued a joint call for a prompt, thorough and independent investigation into the death of indigenous leader Berta Cáceres of Honduras. In a statement today, anti-dam activists expressed their grief and anger over the killing of Cáceres, 45, defender of the rights of the Lenca people. She was murdered in her home in La Esperanza, Honduras, last week. The coordinator and co-founder of the Council of Indigenous Peoples of Honduras, Cáceres was awarded the $175,000 Goldman Environmental Prize for Central and South America in 2015. Less than a year later she was killed. Her death on March 3 comes as Lenca communities are being violently forced from their land and the Agua Zarca hydroelectric project on the Gualcarque River, defeated in 2013, has resurfaced. The Agua Zarca Project is located in the Department of Santa Barbara in the northwest of Honduras. 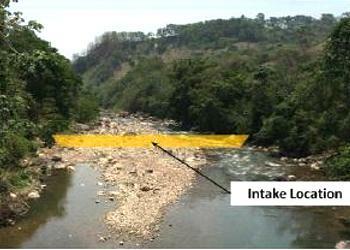 This small-scale run-of-river hydroelectricity project is planned to generate 98.8 gigawatt hours annually. In October 2015, Cáceres joined indigenous leaders opposing dams from around the world in Miri, Sarawak, Malaysia, for the World Indigenous Summit on Environment and Rivers, or WISER. During the WISER conference, Cáceres spoke about the threats she and her community faced from the military, paramilitaries, police, and hitmen for opposing the Agua Zarca dam. “Ten members of our organization have been murdered; four of them for defending the Gualcarque River,” she said. During the week-long WISER summit, the exchange between participants revealed similar realities in indigenous territories around the world. Traditional practices and territories are threatened by dams, extractive mining, logging concessions, monocultural crop expansion, and faulty carbon credit projects that the indigenous leaders say result in so-called “development” for the already wealthy elite. Hearing of the murder of their companion, the WISER representatives and organizers from the United States, Switzerland, Malaysia, Indonesia, Cambodia, Philippines, and Brazil issued a joint letter to Honduran embassies worldwide asking the Honduran government to conduct a prompt and thorough investigation into Cáceres’ killing. They ask also that the Honduran government stop the Agua Zarca dam, and provide human rights defenders with protection. In the Honduran capital Tegucigalpa, President Juan Orlando Hernandez Sunday requested that the United Nations High Commissioner for Human Rights Ra’ad Zeid Al Hussein oversee the investigation into Cáceres’ death. “In the spirit of cooperation, collaboration and transparency for bodies Protection of Human Rights and the Honduran society in general, we ask Your Excellency soon accompanied by his Office to process monitoring and investigation of the case of the death of defender of human rights, Berta Caceres,” wrote the President. On the day of her death, Hernandez called the crime “a direct attack on the State of Honduras” and highlighted Cáceres struggle for human rights and the environment. Later that day, specially appointed investigative teams were sent to the scene, and the Violent Crimes Unit was activated to work in coordination with the United States and other countries willing to cooperate in the investigation. President Hernandez said all state security forces have been activated on the case, including the National Police, teams of the Directorate of Intelligence and Research, the Public Ministry, the Technical Criminal Investigation Agency and the Police Investigations Department. In Washington, U.S. State Department spokesman John Kirby Friday called the slain activist “a dedicated defender of the environment and of human rights” and called on the Honduran government “to conduct a prompt, thorough, and transparent investigation and to ensure those responsible are brought to justice.” He offered the “full support” of the United States. 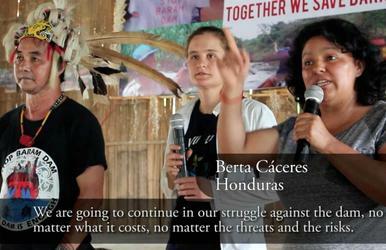 The indigenous anti-dam activists are inspired by Cáceres’ passion to struggle. Groups signatory to the statement include the Bruno Manser Fund based in Switzerland, The Borneo Project and Klamath Riverkeeper headquartered in the United States, the Cordillera Peoples Alliance of the Philippines, the Indigenous Peoples’ Alliance of the Archipelago from Indonesia, and the Sarawak Native Customary Land Rights Network of Malaysia, among others from Malaysia, Cambodia and Brazil. “We call on international dam builders and financiers FMO, Finnfund, CABEI and Voith-Siemens to immediately pull out from the Agua Zarca dam project,” he insisted. “We also call upon the Honduran government to do anything in their power to stop the ongoing violence and killings in their country,” FMO said in a statement Friday. FMO and other supporters of Agua Zarca say it would benefit the region. “At the regional level, it will strengthen the existing energy grid allowing for a more stable supply of energy and enabling new connections. It will further diminish the country’s reliability on coal and support emission reductions,” FMO said in a statement. FMO says it welcomes the involvement of nongovernmental organizations and local people and respects their rights.